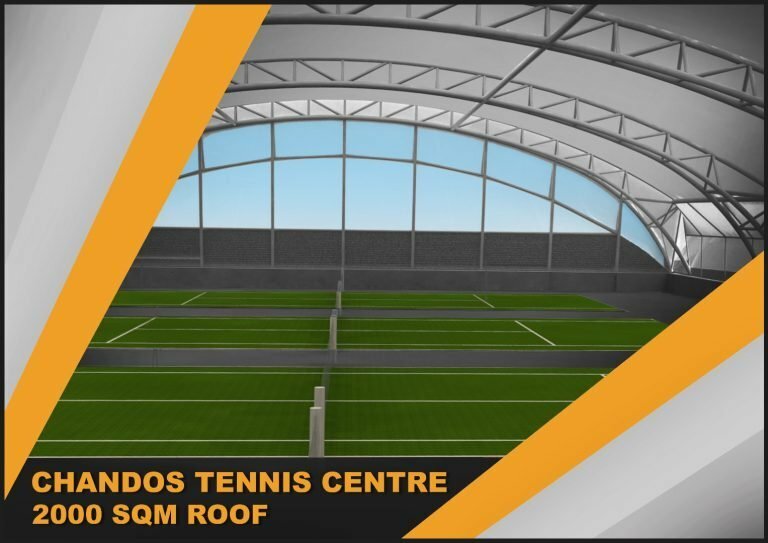 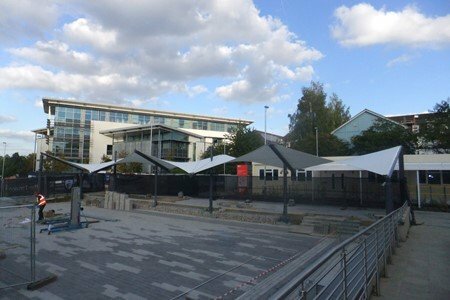 As part of a remit to improve social spaces at Middlesex University, Fabric Architecture were selected to supply tensile fabric structures as a shade and shelter solution for the Hendon Campus in North West London. 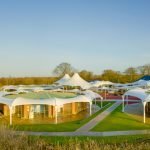 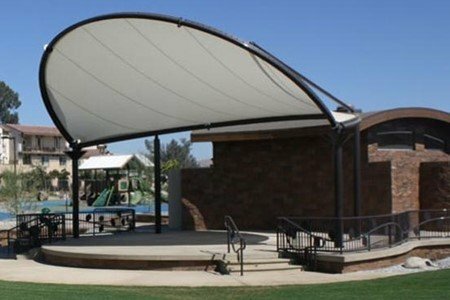 Fabric Architecture’s structure moves away from the typical barrel vault design normally reserved for such projects, to an undulating hyperbolic form that delivers both visual impact and practical shade and shelter. 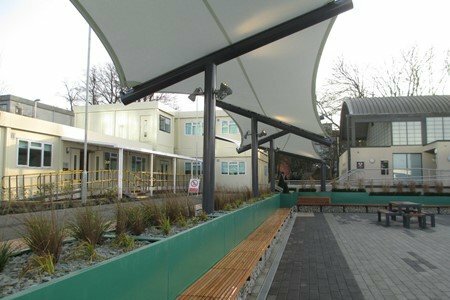 Working closely with bpr Architects, Curtins structural engineers and main contractors Coniston, Fabric Architecture designed, engineered and installed a 105sqm bespoke canopy outside the University’s sports facilities alongside a smaller entrance feature following the same form. 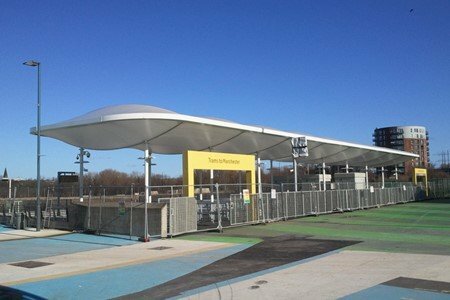 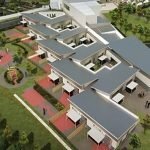 As well as the canopy, the walkway’s framework also required an alternative solution… unlike most canopies, this had to be fixed to a large steel sub-structure rather than simply installing onto concrete foundations. 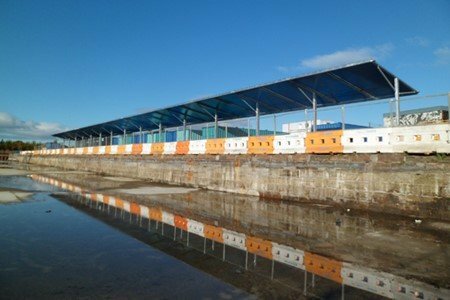 The sub-structure was designed as a level terrace over sloping ground and each mast for the fabric canopy had to interface exactly with the steel uprights below. 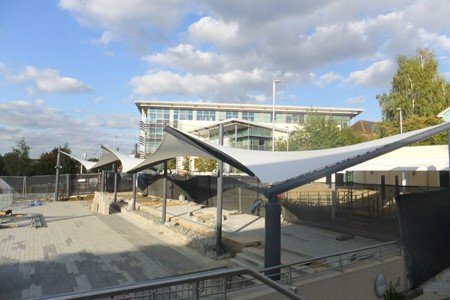 With a cross-collaborative approach, FabArc designed and engineered the canopy simultaneously working to bpr’s original concept whilst liaising with Curtins’ engineers to ensure the loads could be supported by the steel sub-frame. 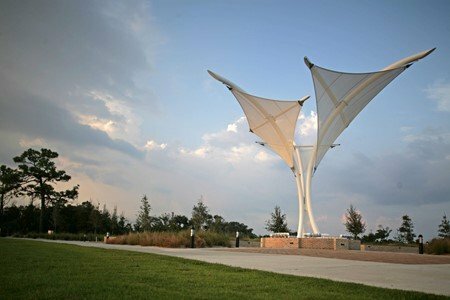 The area where the canopy is located is a fire escape route and assembly point, so an inherently flame-retardant woven glass fabric was recommended. 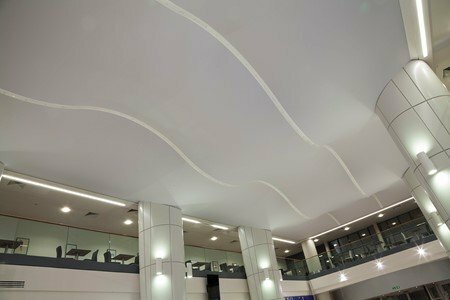 Environmentally-friendly and highly-translucent, the fabric suits the overall simplistic design. 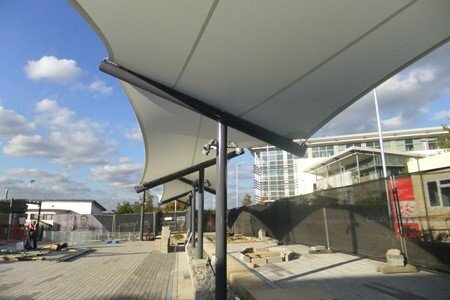 Steel was kept to a minimum and replaced with cable systems wherever possible to avoid looking overly ‘clunky’, which alongside hidden electrics for down-lighters and smooth powder-coated framework, resulted in a crisp and fully-integrated hybrid canopy.